First time I’ve bumped to choice of road bike tires just when decided to purchase road bike. Based on network knowledge “stock” tires (those that installed to bike) must be replaced as soon as possible. Before road bikes we rode on MTB bikes (and tires), so road bike tires looks very unreliable against punctures. That why I bought “bulletproof” tires and used it for three seasons. Unfortunately, this medal has “reverse side” as this tires badly roll and poorly gip in corners. So if not only ride but take part in any amateur competitions I need other tires. But what? A little more detail. Road bike came with Vittoria Zaffiro Slick, it’s quite heavy and not very puncture-resistant tires. By the way, translated from italian Vittoria means victory, and Zaffiro – sapphire. I’ve ordered immediately Continental GatorSkin. Gator skin means alligator leather. Why these? Because these tires immediately won internet search for maximum puncture-resistance (puncture proof, puncture protection, even”bulletproof”). Before this we rode a mountain bike on Conti (Continental) and were satisfied by this manufacturer. Additional search inside Continental road bike tires brought another three models, but GatorSkin was ahead on puncture-resistance. This model produced since 2010 and is very popular as a tires for a “European Winter”. New all-seasoned models of Conti did not stopped production of GatorSkin. Since that choise 3 years passed, but nothing has changed. 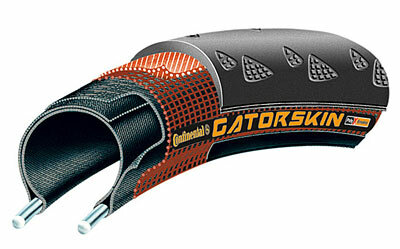 Continental GatorSkin still produced and remains the strongest road bike tires. 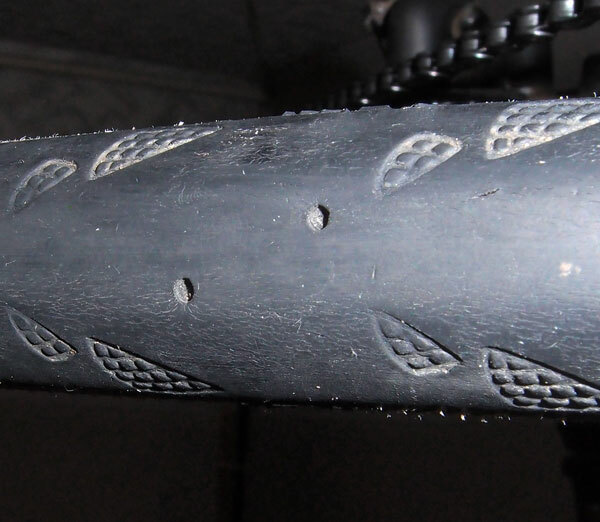 For three seasons on our two bikes GatorSkin really never punctured, but several times were pinch cuts in the tube inside the rim (so-called snakebite punctures). This is from my point of view does not characterize strength of tire, as is due to other processes (pit hole with sharp edges, too low pressure in tire, sharp stone on the road, etc.). Snake bite can happen on any tire on any bike, including MTB. My GatorSkin have total mileage of 10.7 thousand kilometers up today. Judging by the wear indicators GatorSkin could be ride a lot more. “Square” profile is present, but not very big. What is wrong with these GatorSkin tires? Firstly, they do not roll. 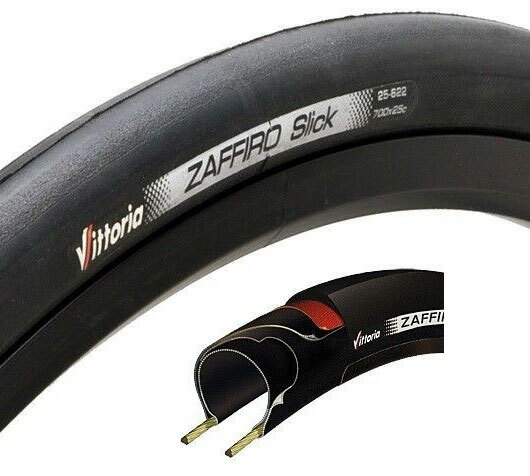 It was felt immediately when put them instead of stock-tires Vittoria Zaffiro Slick. And it was strange, because when I’ve replaced stock tires on MTB to my first Conti sense of rolling appeared immediately. In addition to own sense there are objective parameters. 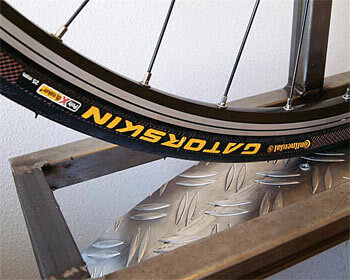 Site Bicycle Rolling Resistance provides measured in the laboratory coefficient of rolling resistance for GatorSkin as quite large, at the bottom of the list. More about rolling of GatorSkin was reviewed in my article: “How speed depends on tires quality“. This laboratory coefficient I checked in the field measurements and got the same result (read more here:”Finding cycling perfomance parameters using another’s power meter“). From laboratory measurements it can be seen that Vittoria Zaffiro Slick really roll better, while top-end road bike tires roll even better. This corresponds to about a raise of 1 km/h in speed. Moreover, in practice, maybe more, since damping will improve overcome of irregularities of road surface. Secondly, GatorSkin poorly grip. We are talking about the maneuvers. 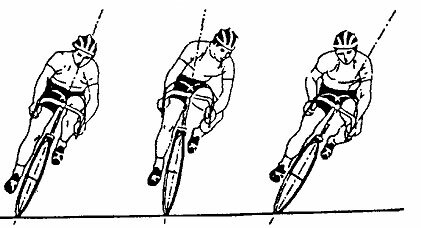 Cornering should be passed very carefully. Again, in comparison to stock tires. In the season 2016 in the Moscow region was appeared a good opportunity for regular amateur group racing-training. And for the first time was competition of format “Grand Fodo” which is interesting for me . Therefore, I decided to go to another Internet search regarding the choice of tires for the amateur racings. The main idea is: GatorSkin give in my case excessive protection against punctures. I believe that it is possible to ride without puncturing on our summer roads on weaker tires, but that better roll and better hold in turns. What does it depend on? 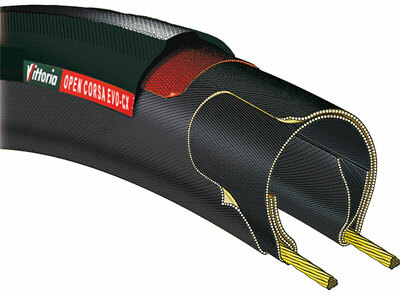 Compound, puncture-resistant layer characteristics and softness of the side walls. If compare to GatorSkin, it turns out like this. In GatorSkin rubber issturdy and solid. All sorts of small stones and debris does not stick to it. This – plus and moreover, the fundamental concept of this tires. Related minus – tire not “stick” to the road. This affects the rollings, especially noticeable on a good, smooth pavement. Rolling friction is based on principle that the adhesion between the wheel and the surface must be 100%. If there is some slippage, this is “other” friction that spoils rolling. Similarly, when the maneuvers, more “sticky” wheels will certainly be much better to hold in turns. Of course a softer compound will be worn much faster. Typical figures suitability of such tires – 3000 km, there may be not enough even for one season. Of course there are “real” racing tires without puncture-resistant layer. In principle, only it is necessary to walk with a broom on the road before the race. But in amateur competitions and training puncture-resistant layer is needed, therefore I have considered only such tires. Repelled from GatorSkin is difficult as puncture-resistant layer there by the standards of Conti is “old” , and the tire is light indeed, that is, its still there a little. But apparently solid compound works well, at least visually tire is smooth, that is trash usually does not reach to puncture-resistant layer. What happens at the softer and, most importantly, a more sticky compound is difficult to say. I know that experienced riders periodically clean tire by glove “on the fly” after the section with any crumbs on the pavement. Here, unfortunately, is nothing graceful been invented. 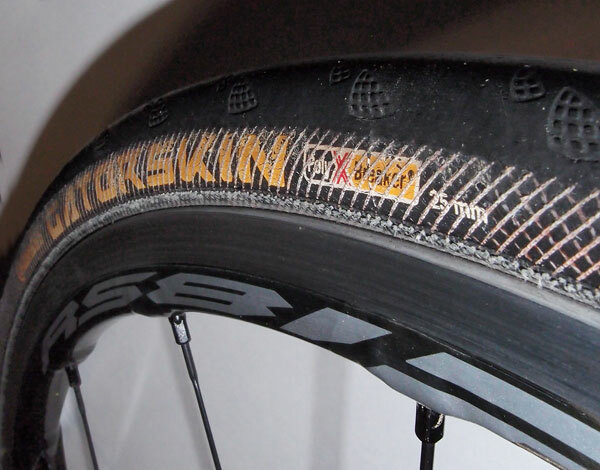 GatorSkin like other tires for Endurance (long rides on bad roads) has reinforced sidewall. This is because a significant part of the punctures goes from the side, mostly from scattered gravel on the road. That is, when hit by a pebble, it can just crank so that strike sharply on the side wall. Unfortunately, rolling of tires crucially depends on the elasticity of the side walls, as the tire deforms when driving. On the deformation energy is expended, which is taken from the motion. 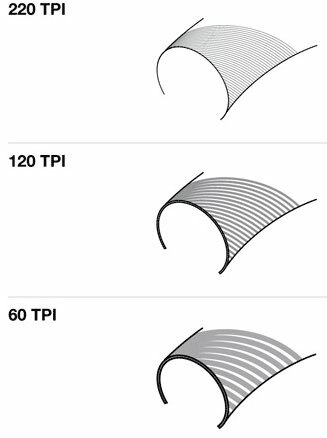 An important indicator of the elasticity of the side wall – the so-called TPI, the number of threads per inch. More precisely even not number but thickness of each thread. If GatorSkin this parameter, by the way is good, but what’s the point if another layer of special net is done over this? The strength of the sidewall depends also from compound. But in general, alas, tires for even an amateur race have not strong sidewal. Therefore, judging by the reviews, the service life of such tires in half of the cases is not determined by the wear of compound but by case of hit a stone that cuts the sidewall. Generally better to carry a spare tire for rides ( 🙁 ). I turn to a possible choices of road bike tires. 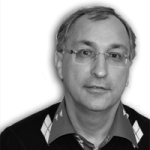 In principle after digging the Internet and optimization of reviews, there are not very many. I focus on only three manufacturers: Continental, Michelin and Vittoria. In each manufacturer I will consider a model like GatorSkin (for endurance rides), ie protected from sidewall punctures, and a next step toward speed (and correspondingly lower reliability) for amateur races. To begin with Continental. The nearest analogs of GatorSkin are “Gator Shell” (characterized by a another protection layer against puncture and heavier) and “4 seasons” (another compound). Judging by the reviews, these tires do not roll much better, and “4 seasons” also less durable. This fact confirms that the combination of compound and construction of GatorSkin was so successful that the tire continues to be produced in parallel with the next generations of tires. 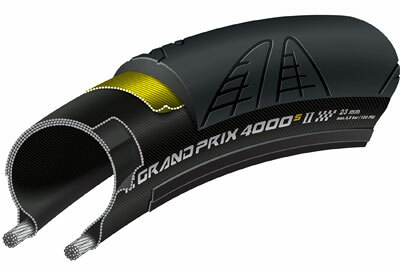 Tire for amateur competitions – Gran Prix 4000S II (now on sale is the second version). This tire have sticky compound which is named Black Chili (black pepper) , puncture-resistant layer , thin and flexible walls. Perhaps the most popular tire in English-writing-Internet for amateur competitions. In Runet to it quite a lot of criticism. If the average, it turns out like this. Firstly, tires fails long before wearing of compound because of wear or cut of the sidewalls (typical mileage – 2000 km). It is expressed in the incessant punctures in seemingly sufficient working tires. Secondly, the width of tire is 2 mm larger than stated. 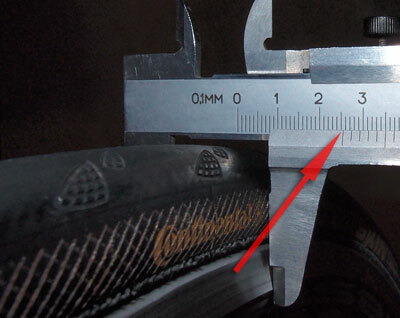 That is the tire written with width of 23 mm is in practice 25 mm and 25 mm – 27 mm. In my case, this is critical, because my tire GatorSkin 25 mm hardly but compatible with the existing light rear fender (to fit 25 mm had to slightly change the design of the fender, but this is the limit of changes). 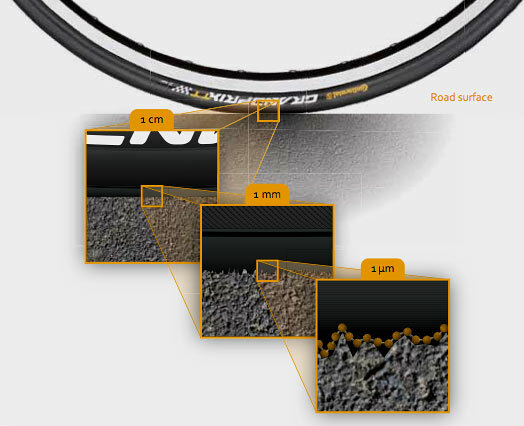 In addition, there is a opinion that puncture layer was designed for a nominal width, that why more “de-facto” width leads to the fact that the unprotected sidewalls go to the road surface. Judging by the reviews, resistance to puncture of tire 25 mm dramatically better than 23 mm. Apparently it just because of puncture-resistant layer width, which in the tire width 25mm little wider and this is enough for take away sidewalls from the road surface. The composition of the “Black Chili” judging by the reviews less tenacious in comparison with the other two producers of those surveyed. That is, the crumb collecting is well, while clings in corners is not much compared to Vittoria and Michelin. 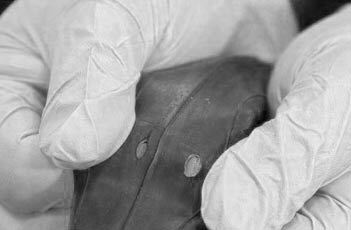 However, the tire well made, quality of the compound is stable, and in general, positive feedbacks are very, very many. This is due to the fact that the 25 mm model is often used as a universal tire. 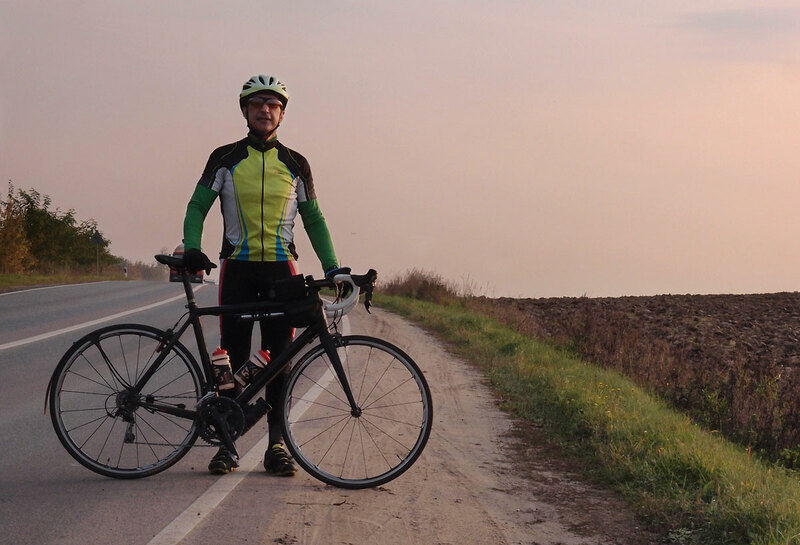 And for trips around the city, and for brevets and for races. Therefore, the set of parameters of Conti GP4000S II for speed and grip turned to standard like GatorSkin for boolet-proofness. The closest analogue of GatorSkin is Vittoria Rubino (it translated as ruby). In principle, a very popular tire. It is all a step from GatorSkin towards better rolling. Softer compound (less mileage), lower puncture resistance, but greater elasticity and better roll. And reliable enough for brevets. And sometimes they use for amateur races, grip allowing for this. 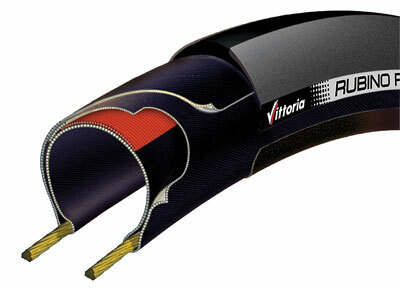 Perhaps if such a tires were on my bike “in stock” instead of Vittoria Zafiro, I would not have sought nothing more. Nevertheless, there are more racing tire from Vittoria, which include in the title word Corsa (in means – race), which is thinner, faster, and that it is an analogue of the mentioned Conti GP4000S II. 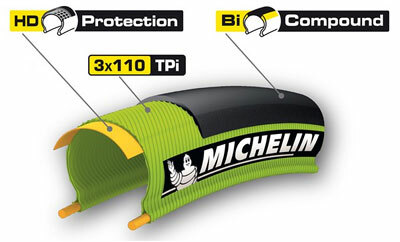 The tire is considered by the reviews faster then Conti, better hold in the corners. But also usually got to end because of unpredictable side cuts. 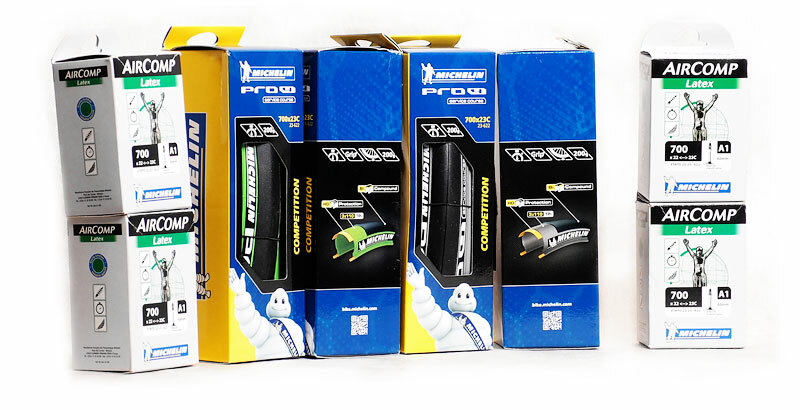 Analogue of Conti GP4000S II is model with the word “course” in the title, for example, now there is a sale of tires: Michelin Pro4 Service Course. Why “course”? Because this word just means “race”. Why selling? 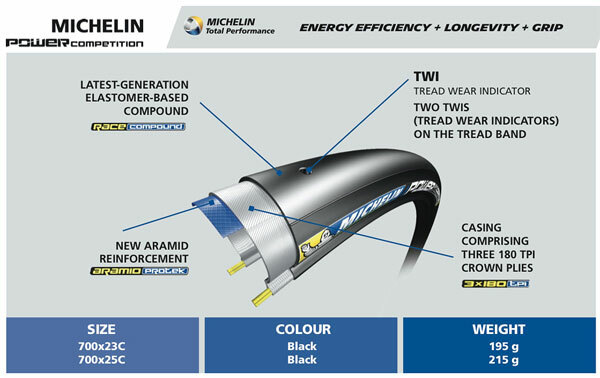 Because Michelin has released a new line “Power” instead of Pro4 with new compound and a larger number of threads per inch with an claim of reduction of 25% rolling resistance. Hard to say, but it seems that the new model “Endurance” became more similar in design to the old “Course”. 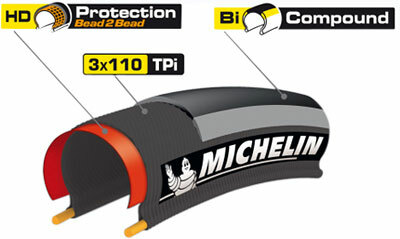 The main feature of “old” Endurance – an additional layer of sidewall protection “bead-to-bead” (from rim to rim) is removed. The new model Power Competition is another step in the direction of increasing the speed and decreasing reliability. According to the construction is as “old” Course or “new” Endurance, but made of more subtle and flexible materials. However, the “old” the Endurance in the new line can also be found by the identity of construction. Now it is called “Protection +”. Models are new (since spring 2016), the prices are high, feedbacks from users is very few. But those that have a pretty good match to design. Rolling of new models become noticeably better while durability markedly worse. Three reviewed manufacturers of course not the only ones. But for the case: a good rollings while strong enough road bike tires they are the most popular manufacturers who shares market. Offhand all the rest goes to 10%. The above models are different, but the trend is smooth, without “wonderful discoveries”. The higher reliability of the tire, the worse it rolls. Moreover, the reliability of this, unfortunately not determined by mileage, but by the probability of an accidental cut of side wall after what tire must be thrown away. Or sudden constant punctures because the sidewall is transformed into a sieve. That is, you could easily stop in the “field” without the possibility of return by own wheels. 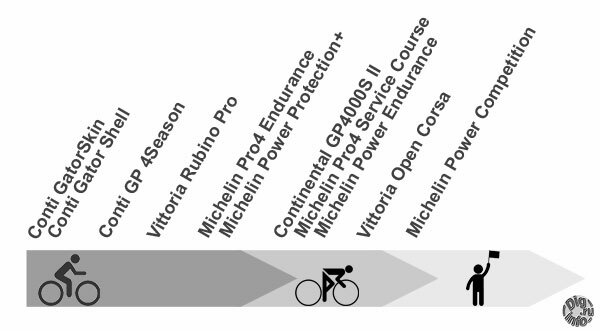 So, if start from Conti GatorSkin, then it nearby Conti GP 4 Season and Vittoria Rubino Pro with slightly better rolling and slightly less resources. This reliability is almost the same, that is, you can be sure that the random cut the sidewall is not. Gator Shell can not be in focus in comparison to GatorSkin, in my opinion is different only in that the heawier. Rolling of these tires are not so much better than the GatorSkin has, that is no reason to change one to another. 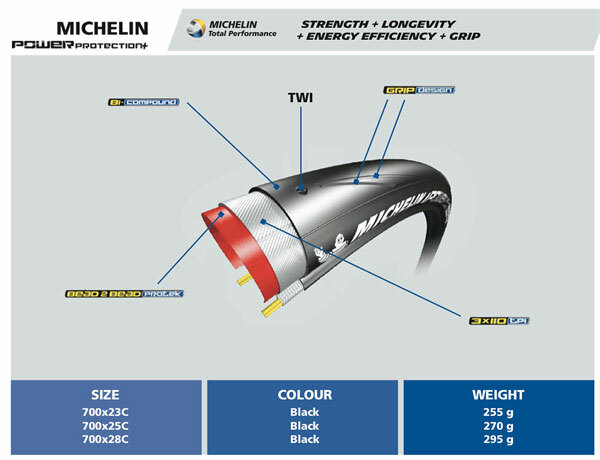 Further of those surveyed are Michelin Pro4 Endurance (old) or Michelin Power Protection +. Apparently you can still believe that this is one and the same tire. Rolling is even better, but because of the soft and sticky compound could be troubles. It should be cleaned after the passage area with dirt, and need often to inspect it. Otherwise, stones adhering strongly reduce resource. But the sidewall is strong, therefore accidental cuts should not be. All these tires are still not for racing, even amateur one. That is, you can certainly participate, but then on GatorSkin also possible 🙂 Next is the “boundary model” Continental GP4000S. Compound is less sticky than the Michelin Endurance, but still some unique (hereinafter in the line of all tires compound is a work of art in the alloy with science). Probably for me, this tire would now be the most appropriate, if it did in the “fair” width of 25 mm. Or 23 mm, but also honest. 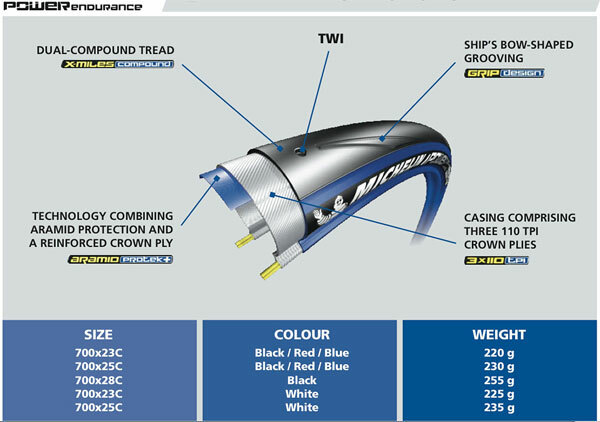 The current “23” when puncture resistance layer correspond to size 23 mm while weak sidewalls correspond to 25 mm this tire loses reliability. In principle, nothing unusual there, all the tires “on the other side of the border,” the same unreliable, but those even better roll. 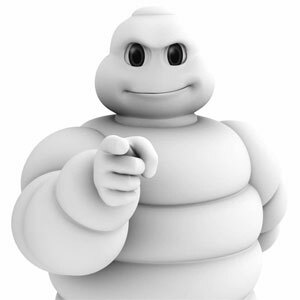 At the same border, perhaps, is Michelin Pro4 Service Course (or the same, that the “new” Michelin Power Endurance). That is, it can and will be lucky to go a long time, but can break quickly. But still there is hope for a couple of thousand kilometers. These tires are rolled much better than the group “GatorSkin”, so the risk is justified. It is possible to carry a spare tire and feel free 🙂 And finally, of those surveyed Michelin Power Competition, about it I can forget. It most can be attributed on reliability to the tires without puncture layer for which the road is necessary to sweep pre-race to avoid stones. Most likely puncture layer here not needed because sidewall suffer earlier. Pehaps, this tire has made to clear the Vittoria Open Corsa from first place on rolling in semi-professional competitions like triathlons.